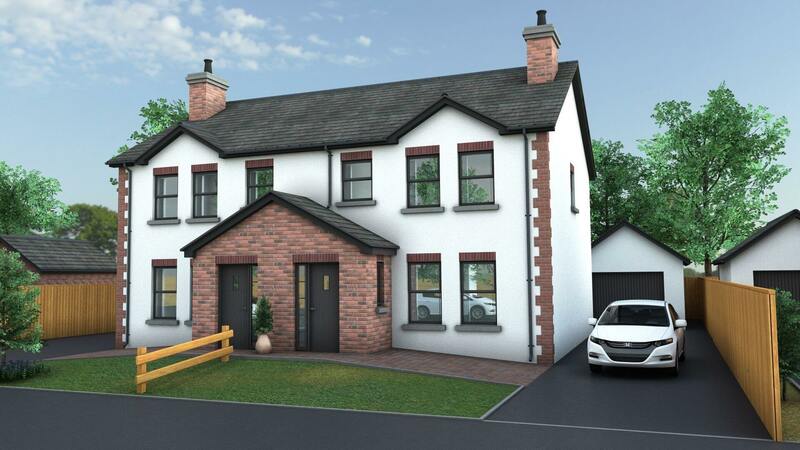 The Shimna is one of our larger 3 bedroom, semi detached properties available at Riverglade Meadows. Offering 1116sq. ft. of exceptionally well designed living space, including a large kitchen diner with rear patio access and generous living room. The Shimna also has three large double bedrooms (en suite to master bedroom) and main bathroom with free standing shower. Kitchen/Dining 5.8m x 3.8m 19' 1" x 12' 6"
Lounge 4.9m x 3.8m 16' 1" x 12' 6"
9' 10" x 9' 2"
9' 10" x 8' 6"
14' 9" x 11' 6"
7' 7" x 6' 3"
Bathroom 2.6m x 1.7m 8' 6" x 5' 7"
Tarmac driveway with parking for 2 cars. Timber fencing to rear garden boundaries. Traditional masonry construction with brickwork and render. Feature light to front and rear doors.